PC Scoreboards computer-based scoreboards transform your PC's display into a professional scoreboard that can be used to keep score at games. 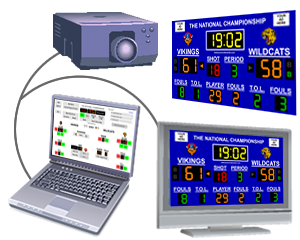 By connecting your PC to a large screen display or projector, you get all the features of a physical scoreboard at a fraction of the cost. Download and install a FREE copy of any PC Scoreboard from our website. Connect a large screen display to the computer. Run the installed scoreboard on the computer. Position the scoreboard's display window on the large screen display for the spectators to see. Position the scoreboard's control window on the computer's main display for the scoreboard operator to see. For more information see Screen Setup.